Phyllis Martin, age 77 of Boone, died June 23, 2018 at the Mercy Medical Center in Des Moines. Following her wishes, Phyllis has been cremated. A Memorial Service will be Monday, July 2, 2018 at 10:00 a.m., at the Schroeder-Reimers Memorial Chapel at Sixth and Marshall, with Pastor Mike Carlson officiating. Burial will be in the Pilot Mound Cemetery in Pilot Mound. Phyllis JoAnn (Paris) Martin, was born in Boone, Iowa on September 7, 1940, the daughter of Leo ‘Bud’ and Gladys (Majors) Paris. She graduated from Boone High School in 1958. In August of 1958, Phyllis married Howard Williams in Fraser, Iowa. The couple divorced in 1980. In November of 1981, Phyllis married Burdell Martin in Boone. The couple divorced in 1991. In earlier years, Phyllis worked as a clerk at the Boone Fareway Store, as a book binder and clerk at Boone Blank Book Company owned/operated the Hamburger Inn, both formerly in Boone. She lived in Colorado from 1991 to 1995 where she worked at Hewlett Packard. Returning to Iowa and living in Des Moines from 1995 to 2007, Phyllis worked at Meredith Publishing and GuideOne Insurance. 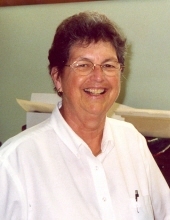 Phyllis later worked for the State of Iowa in the Child Support Recovery Division in Des Moines, retiring in 2006. During retirement, Phyllis worked for the valet at the Boone County Hospital. She was a Life Member of the V.F.W. Auxiliary in Boone and enjoyed bowling, Bingo, watching the Golden Girls on television, and growing tomatoes. She is preceded in death by her parents, son, Jeffrey Williams, and a sister Marilyn Klemme. Phyllis is survived by her daughter, Jolene Brown and husband Chuck of Boone; daughter-in-law, Renee’ Williams of Boone; two grandchildren, Courtney Davidson and husband Joel and their children, Madelyn and Sam Davidson of Boone and Brennan Williams and wife Danelle and their children, Kensie and Annie Williams of Boone; two brothers, Bob Paris and Don Paris both of Boone; a sister, Beverly Fowles and husband Darrell of Boone; numerous nieces and nephews. Friends may call at the Schroeder-Reimers Memorial Chapel on Sunday from 4 until 8 p.m. where the family will be present from 6 until 8 p.m. On Monday, friends may call from 8 a.m. until service time. In memory of Phyllis, memorials may be directed to the family and no flowers are requested. To send flowers or a remembrance gift to the family of Phyllis Martin, please visit our Tribute Store. The family will be present from 6 to 8 pm. "Email Address" would like to share the life celebration of Phyllis Martin. Click on the "link" to go to share a favorite memory or leave a condolence message for the family.